In today's episode, we're talking Analytics. It's key to understand the data around your business so you know whether your marketing is effective. Today we talk about the basics you need to understand to allow you to track and measure how your business is doing. Darryl: Welcome to My Bloody Website, the show where we talk all things online for small and medium business owners for executives who still refer to Their Bloody Website. I'm one of your co-hosts, Darryl King. Edmund: And I'm Edmund Pelgen. Darryl: Hey Edmund. How are you going? Edmund: Not too bad Daryl. Yourself? Darryl: Pretty good for a young feller. Still lots of good feedback from last week's episode with Jason Mun. Smart guy, loved that. Very good. Edmund: He knows his stuff. Darryl: He does and it's good. E-commerce is a big part of where we're going so I think if you didn't listen to last week's episode and you're into selling online please go listen. It was a cracker. Darryl: This week though we're going to talk data, numbers, metrics. We're going to dig into the basics of analytics and that might not seem very exciting to people but it is fundamental of all things good online is being able to measure and understand what you do. We're going to dig around this a little bit, cover a couple of things off and set the tone for it. We're hoping to have an analytics guest on later this year who can talk more about key things people should look at. But we both see it where people don't have analytics and they don't even look at their analytics right? Edmund: Yeah. I think it's important to make the distinction that every good business owner should be tracking and measuring their numbers. To some extent when we say analytics we mean those things. You know what metrics are driving your business, et cetera. But as we relate to an online business the primary tool or the mechanism by which lots of us measure the performance of our digital assets is through online analytics tools. Obviously the biggest one is Google Analytics. Most people would have heard of them. Darryl: What do we mean by analytics or Google Analytics? What are we really talking about? When you and I say analytics we're talking about Google Analytics. What does it do for us? Edmund: Absolutely. The reason when you talk with an SEO or a paid advertising agency, the first thing they ask you is, "Can you give me access to your Google Analytics?" The reason is because they want to understand how your website is getting its traffic currently. Where are people finding you? Are they finding you in Google search? Historically have you been running paid advertising? Are they coming from other websites? They want to understand how your business currently finds its customers. By understanding that it'll help them formulate strategies going forward. That's one reason. When we talk about analytics what we mean. The other reason is, we want a mechanism by which to measure the results of our efforts because at the end of the day everything that we do from a marketing perspective is all about bringing people to the website and then having them do something. Whether that's buying something or whether that's signing up to a newsletter, it's actually doing an action which is what we call a conversion online. 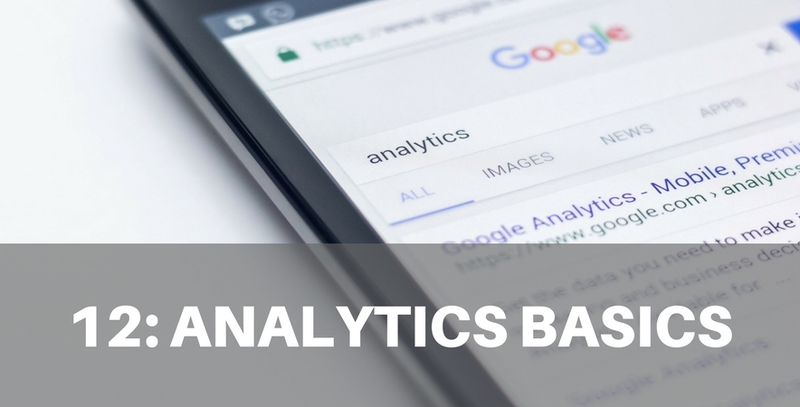 Google Analytics at a very basic level is a simple tool that allows you to understand A, where the traffic is coming from, and B, what do they do when they get to the website? By extension helping you then determine, "Okay, when should I then invest my marketing budget?" The software Google Analytics then compares all the data that it's gathering and presents it in a user-friendly way. So it can say, "This page, average gets two minutes 20 on page," for example. Then, "60% of people went from this page to this page." It makes it user-friendly but at its most fundamental level it's just a tracking code, a tracking device that just measures stuff. The first thing there is how do you know if it's on your site? The easiest way is if you go to your browser and if you don't know how to do any of this, sorry. We'll maybe put some notes or something. But you can right-click and go, "View page source." THere's different ways in browsers that you do that. But if you view page source and then you do control F or command F, depending on what keyboard you're using, and just put the word analytics in. If Google Analytics is installed on your site it will scroll and highlight a little three or four lines of code that has a GA hyphen or is it UA now? It's UA isn't it? Darryl: UA hyphen number, there's a number. But there's code there and you'll see the word analytics in it. That's the simplest way that normally we'll pick it up. I'm not sure of that, with tag manager and everything else it'll show it all the same way. But that's a starting point. If you've got tag manager it's a whole different thing anyway, you're pretty much covered probably. But you need to have it installed. This or some other form of analytics. Edmund: Absolutely. Like you said the reason you need to have this on there is so that you can make some good decisions about what to do with your money. Darryl: Yeah. You talked about it from an SEO pay-per-click perspective. I'd like to say there is a design and a planning side to this as well. If someone comes to me and says, "I want a new website," Google Analytics can actually provide us with information to help make smart decisions. These are the decisions that if you do properly combine all of these specialties because you want to understand key words and where traffic's coming from. But you also want to understand what existing content on your site gets traffic now and how well do people interact with that content. If you've been writing blog posts and guides and pages for a period of time it will quite often get in the design phase, "You know the latest thing now is we do this, or we're going to go to a mainly one page scrolling website, blah blah blah blah," without taking into context the traffic you've already got and the conversions you're already getting. Generally we make changes to improve, that doesn't mean what's come before is all bad. Before you rush off and buy a thing next and change all the URLs and get rid of all this content you actually need to know, "Gee, I wrote that article four years ago and it's still bringing me traffic." Ed and I have been in site changes and migrations where people have ... Literally I did one in 2017 where a published author of four books had some old domains, moved to a brand-new domain and the development team said, "Don't worry about all that old content. It's useless." They just stuck up a message on the old domain saying, "Well we've moved." There was no redirecting, there was nothing done. Most of the old articles were the primary sources of traffic. The whole new site had none of the old content and it had no redirect and nothing. There's real value in knowing that. Rather than people just telling it. This guy, this owner of this business, he's not the youngest chicken in the ranch and he's pretty progressive but he's not going to be deep down on all this data and he doesn't have to be. But he could have argued back with them or shown them like, they should have all been sitting down talking about it. "Well let's have a look at the actual traffic data, before we make decisions, before we go and build this new website." Before we say, "Nah, we're just going to throw it all away," let's look at our analytics and make smart design decisions as well as that impact and everything else. Analytics really is one of the key foundations of any good website. Edmund: Absolutely. It's surprising how many websites we've seen that get built with no analytics installed even to this day. Darryl: Yeah it's pretty frightening. We're talking about stuff in 2017, it's not the early days. Let's go a little bit deeper Ed, things that a business owner would care about. I know we talked on loose terms. Let's talk about what a funnel is from an analytics perspective. This is something we should talk about. The last episode, episode 11 we had J Salon talking E-commerce. Let's talk through a scenario in analytics. I've got category pages, I've got product pages, there's obviously shopping carts and checkouts. How would analytics help me improve the performance? Edmund: Absolutely. At a very basic level, as a business owner you probably have an understanding of how your customer is probably going to go online and search for things. That's a hypothesis in your head just to some extent. If you don't have the data to support it it's what you think and believe. If we use E-commerce as an example. You know people using the men's clothing example in this case. You know people might start searching for men's T-shirts and then they might see some content and then they might refine their search to say, "Men's V-neck shirts." Then they might say, "Hey, I want cotton." So they'll refine it to say, "Men's V-neck cotton shirts in blue." Based on that understanding of how people search you might craft your website with categories and subcategories before you even get to the product page. Well you can validate that by looking at your analytics and seeing which pages on your website, which category pages so men's T-shirts or is it men's cotton T-shirts or is it the actual blue men's cotton T-shirt size four that are actually bringing in the traffic? Analytics will tell you that hey, your T-shirt category, your men's T-shirt category is bringing a lot of traffic. So it'll validate that assumption but it'll also help you understand, "Hey, this is actually how people are searching." You can then start to look at the traffic from one page to the next and it'll give you an idea about how people are behaving on your website. So that's it at a very basic level. If people land on this page and then by adding it to their shopping cart or basket that will show up. So you can actually set up and see funnels on your site that people typically land here, then they will go to this page, then they'll do this, then they might put something in a car. Then do they go straight from the car to the checkout or do they shop again and come back? You can actually see that. And then you can see people that actually left your site. If they put something in the cart and left the site. If they went to x many pages and left the site and they never put it in the cart. This data provides you heaps of information and helps you understand. Shopping cart abandonment is a thing that happens on all sites. It's the same thing as someone walks around the store, they might pick up a few things, touch them, then they put them back and walk out. They didn't buy. There's lots of reasons why, maybe their phone rang, their partner was outside the store. "I want to go, I'm hungry." [inaudible 00:12:11] in the real world. Boss comes in the office, quick, change the screen. Kids want dinner, whatever it might be. "Favorite show's coming on, I'll do this later." People abandon [inaudible 00:12:26] you don't know why and people often say, "My SEO's not working, my paperclip's not working, my shop's not working my site's not working." Analytics provides you with detailed information that can be analyzed to help you find issues and fix then and test hypotheses like we said before. Edmund: Absolutely. A classic example in this situation that you're describing is where with analytics you might have a shopping cart abandonment scenario where people getting to the shopping cart and just not clicking that, "Pay now" button and you're wondering why. I've seen an example where someone filtered the analytics traffic and said, "Just show me visitors who came in on a mobile device." They suddenly discovered that their shopping cart page performed terribly on a mobile phone. They fixed that and then conversion rates went up, transactions went up. It's that sort of ability to give you insight into user behavior on the site which is why analytics is so important. Darryl: As we go down that journey of understanding mobile then you get down to the levels. You can filter it by device. You can filter it by browser on a desktop, you can filter it by location. Why are the people of Los Angeles buying heaps of this stuff but not the people in Melbourne? Because we've got free shipping in America and not in Australia. "Okay, right, well what can I do about that? Or can we offer some other incentive?" There's lots of reasons for that. Sometimes there's just no shipping mentioned at all, people get anxious on the shopping cart and they move away. There's lots of things that you can test and analyze but even if you're not selling which of my blog posts gets the highest open rate and engagement? What's engagement? There is terms like bounce rate. A bounce rate is where someone lands on a page on your site and leaves straight away. This is an exit page which is where someone leaves from your site. They could be one and the same thing but a bounce page, you'll get bounces quite often on blogs. You promote it socially, they read the blog and they go. That was what they were there for. We need to understand how this works and then ... I think Gary V uses the jab jab punch method. Sometimes you get them, you get them, you get them and every so often you put other calls to actions in those blog posts or things to try and pawn through deeper into your site or you work on it the way you craft your content. You ask for comments, there's so many things that you can learn out of it that are really useful even for a faux page site with a blog. Edmund: Absolutely. I think one of the most valuable pieces of information you can get from analytics, and especially when it comes to the fact that people are always telling you to write more content is that you can go to analytics and you can see which of your pages, and you pointed to this before, which of your pages are actually bringing traffic to the website. If you've just spent a year blogging and creating what you think is really cool content and you go to your analytics and you can see not a single one of those posts is generating you traffic, you can make a decision about it. What is it? Is it a problem with the content, is it that I'm not promoting it, is it not optimized? You know what I mean? You can make some decisions about investing your time and money in content that either is probably better suited. Darryl: The same thing that you're talking about Ed goes to social media. I know companies put a lot of time into their Facebook, they've got agencies doing and they've got all these posts. You go, "Okay, how are we tracking the financial benefit, the ROI? What is it for my restaurant, what is it for my store, my climbing business?" Whatever it might be. I do all this time on there, what do I get? I know for example some people in minor trades where they get heaps of referrals from Facebook directly to them. So they just call on them and that's great. But what about when you're not awake? Do they drive them to your website, do they take action, do they follow an inquiry? Do you measure that? In analytics you can see the source. Where did they come from? Well they came from Google, they came from Bing or they came from Facebook or Instagram. Wherever they might have come from. Then you've got a better sense and then you can filter them down. You can say, "All right, I only want to see lead conversions sourced from Facebook or all of social or from organic traffic or pay-per-click." Analytics segments out this different data so you can see paid campaigns versus organic. Really it is the nuts and bolts of ... It's like the PNL and the balance sheet of your website. Edmund: Absolutely. It's hugely powerful. I think the most powerful thing is the fact that if you're tracking conversion actions like the things that people do on your website you can then filter and sort that traffic by the number of conversions that it resulted in. You can start to say, "Hey, SEO is maybe generating me more sales or paid traffic generates more, it converts better." Darryl: "And Halloween or other, Thanksgiving. What other holidays can I do work on, like hosts on that work? How can I handle that?" So yeah, okay. How often should a business owner or a marketing person be looking at that? Edmund: To some extent it depends. Some people will need to look at it on a daily basis but if we were just looking at the business owner or a marketing manager for example who doesn't necessarily have really campaign-specific things. Like with paid advertising sometimes there are day starts and stops so you'll have to look at the analytics on a daily basis. But at a very general level I recommended that a business owner jumps into analytics every week just for a couple of minutes just to see how things are tracking, but definitely at a minimum once a month and look at the data on a monthly perspective. Because in reality a lot of business owners are flat out. But if they take the time to jump in at least monthly things can't go too badly in a month if that makes sense. But if you leave it for a quarter you're losing a good part of the year. So each month jump into your Google, stretch it out for the last six months, change the date range and see how things are trending and you'll start to get more insight into, "Hey, what's seasonal?" What's really important I think each time you look at it is to compare it to the same period last year so you can start to see month-on-month comparisons. That'll start to say, "Hey, things are going up, or we're going backwards." Then you can start to take action. At a minimum once a month. Darryl: [inaudible 00:19:44] it and yeah. Edmund: What's awesome is Google Analytics comes with an app. You could have it on your phone so if you've got a spare couple of minutes you can easily pop in and track what's important to you. What I like to tell people is when you jump into analytics start at the very top level. See, "Hey, what's the total traffic been compared to last month as well as the same month in the previous year?" Then I like to have a look at the sources. So where did all the traffic come from? Then finally, I'm getting some zoom action there. Sorry, if you're not watching the video the cameras are zooming all over the place. Finally I like to tell people have a look at then what content is generating the traffic to the site. Then that'll give you a sense of, "Hey, things are moving in the right direction. Things are on the up or I need to fix something or get an expert in to fix something." Darryl: Yeah. I think that's good then, sorry about my camera distraction there Ed. Darryl: It was all focused. If we look at that frequency, my feeling on this is if there's one thing that you as a business owner or a marketing manager should be across yourself rather than a third party it's analytics. Darryl: What do you think about that? Darryl: What are your thoughts on that? Edmund: I think it's a real key ... A lot of people will say, I've heard the excuse before. "That's all that technical stuff, I don't need to know that. I pay people to do that." I think that's wrong. You need to have a fundamental understanding of what you're looking at, of the data, of how the site's performing. Because if you have that understanding then you can start to hold other people accountable and you can hire the right people. If you don't know the very basic concepts around analytics you're going to hire the wrong people to run your business. You're going to hire the wrong people to track and measure things and you'll make poor decisions about where to invest your marketing budget. You don't have to do the work but it's important that you understand at a very basic level what's involved. That way you can make the decisions about who to hire to do the work for you. Edmund: That's a great analogy, that is. You should be able to read a PNL and a balance sheet to know how well your business is going, well you should be able to read the top-level traffic reports in analytics to understand how your website's going and how it's contributing to that PNL. Darryl: So that's the way I see that running. Okay, cool. In that scenario then yeah you can open it up, you can open up your analytics. First of all get access. You should have ownership access to your analytics account, that's one level. I had someone last year that they weren't allowed access to it by the agency, they didn't give them access which means it was probably buried under some corporate account and they lost all that data. That's criminal. You need to have access, whoever set up analytics, it needs to be with ... It's one of your key digital assets that you should have. Once you've got it then rather than just, yeah, poke around, have a bit of a play. But where do they go to learn some more? What are the best places? Obviously it gets [inaudible 00:23:38] courses. I know Google has some free material, maybe we can link to some of that [crosstalk 00:23:43]. Edmund: Yeah absolutely. There are a ton of resources and the challenge is there are resources for beginners and there are resources for people who are more technically-focused who might be working in this space. What I'm going to do is in the resource notes to this episode I'll provide some links to Google's own beginner resources as well as some more advanced blog posts that they can go and read. But what I'd like to also suggest is I'm going to add a link to a ... I'm going to give access for people to a free course that I have done called 80-20 analytics. It's basically a short analytics video course for busy business owners who don't have a huge amount of time. But it just in a couple of short videos will step them through a quick overview of how to read the analytics dashboard and then a couple of key reports they should be looking at on that weekly or monthly basis. We'll provide that link. It's a paid course but you podcast listeners will get it for free. Darryl: Awesome. That's great value. Look, there's a lot of detail when you get the basics understood directly. There are problems with analytics, don't get it wrong. But there are things when you get more complex where you can have issues with paid campaigns tracking 100% correctly. There are things if you're trying to track Facebook pictures on your site and use analytics from that through your E-commerce store, you can get attribution problems. A lot of the old data we used to thrive on from a search optimization perspective such as KeyWord Data isn't available anymore. It's what's known as not provided. There's lots of things that are missing from the data but they're not reasons to not do it. The data you can still collect tells you [inaudible 00:25:20] of information that will help you run your website better and make better decisions. Edmund: Absolutely, yeah. Those things are just at the pointy end of the spear. There's a lot of data to be had from just getting very top-level metrics total visitors. Where are they coming from, what are they doing, how much are they ... What are they buying, that sort of stuff. Then once you've got the basics in place and you've got them working then you can start to spend more time on multi-funnel attribution and all these cool things if you want. But it's not an excuse to not get the basics right. Darryl: I think it goes back to evolution not revolution which is a think I talk to people all the time. In AFL sport they talk about the one percenters and in business you talk about making a 1% change. If you make a 1% change every week of the year from January to December you've made 52% change from where you were at the start of the year. These little things, when you look at your data and go, "I'm not just necessarily chasing traffic or hits but if I'm looking at this metric, if I want to reduce my bounce rate," Well you don't drop it 20% overnight. That doesn't work. It's a strategy and a long-term goal, you've got to test some stuff. But if you can see over time that you're making improvements then that's [inaudible 00:26:36]. Darryl: Buddy I think that's probably a good introduction to analytics for people. Edmund: Awesome. Mate I think that's it for today. If you want to be notified when we next go live please sign up to notifications on our website at Mybloodywebsitepodcast.com or subscribe to the podcast at iTunes. If you enjoyed this episode please leave a review in iTunes. We've got a couple reviews so far and they're excellent and we really appreciate them. It really helps people find this podcast online. We'll look forward to seeing you next week when we'll continue this chat about My Bloody Website. It's goodbye from me. Darryl: And it's goodbye from him.